A maximum of 1 survey completion (or mail-in entry) and 1 entry through the Sponsor's GoRecommend application per day. In addition, a maximum of 1 Daily/Weekly. Sweepstakes prize will be awarded per person per 90 days. PC/Notebook usability rating: 4/5. It takes about 10 minutes to finish with 2 open questions. You need no receipt. Tablet usability rating: 3/5. No mobile page for Tablet. There are 2 open questions, and you need to enter your personal information. Smartphone usability rating: 2/5. No mobile page for smartphones. You can still finish Red Robin Customer Satisfaction Survey via smartphone, but it may take more than 10 minutes to finish. Web entry. Visit the Red Robin customer survey official site and take the survey. Mail-in entry. To enter by mail, with no purchase necessary and without completing a survey, please hand-write the following sentence "Please enter me in the Empathica Daily/Weekly Sweepstakes for a chance to win 1 Daily Prize/Weekly prizes" on a sheet of paper on which you have hand-printed your first name, last name, home telephone number, full address (no PO Boxes accepted), email address, and the name of a participating client and mail it in a separate envelope with sufficient postage to: EMPATHICA DAILY/WEEKLY SWEEPSTAKES, 511 Avenue of the Americas, #40, New York, NY, 10011. Visit the Red Robin customer survey official site. Choose the language English or Spanish you would like to take the survey. Select the type of invitation that you received. Enter requested information from your receipt such as store telephone number, etc. and click "enter". Enter the server's name if you remember. Select answers to the questions related to your recent visit like "Did you dine in or take out?". Indicate how much you agree or disagree with the statements like "The time waiting to be seated was reasonable" based on your recent visit. Answer open questions such as the reason that your were satisfied or not satisfied with the item you ordered. Select answers to the questions about yourself such as your gender. Enter your personal contact information such as your name, email, etc. and click "Next" to finish the survey. 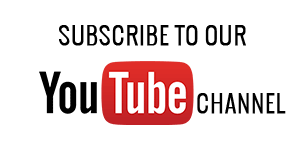 If you have any problem or difficulty to finish Red Robin online customer satisfaction survey, refer to the following survey video recorded by Survebag editorial team. You can also find those related questions and answers related to Red Robin customer survey in this article. Red Robin offers nutritional information for its menu items. You can modify your order to customize your Red Robin selection to meet your needs. Red Robin makes its burgers from the freshest cuts of natural, American-grown beef, free of preservatives and artificial ingredients. Red Robin offers an eClub program. Members can get a coupon for a free gourmet burger during their birthday month and regular email updates on new menu items, promotions and other exciting Red Robin news. To enter the survey, you must select the type of invitation that you received. It can be either a receipt or an e-invitation. Please know that web (and mail-in) entries are offered. You may choose either way that is convenient for you. 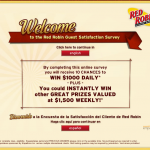 Visit www.tellredrobin.com and finish the survey to win your $1,000 cash and other great prizes. Excellent and delicious. ...good customer service. Food was tasty and something I would order again. Provide horseradish with meal. We had an accidental small spray of water from a waitress' dish pan. The manager did everything possible to satisfy us and was very polite. Couldn't have handled it better. My son's meal was free and could have been replaced for free if we had wanted. Very good management in Kamloops. Food was great as usual. However, the bill was presented and request to settle up less than 10 minutes after we started our meal. The waiter said that the boss wanted to clock off go home, so he wanted to settle up now. That is very unimpressive. I may have wanted dessert, but was rushed to settle up. Are you in the business of serving food or operating your restaurants on as little wait staff as possible? Your web site is confusing, unable to access the $1000 daily survey. Lots off coupons from the resteraunts but no one can tell me how to enter contest. very poor customer service. Great food and great service. Thank you Mandy in Vernon. Always excellent. You have a great manager in Abbotsford. He keeps the restaurant very clean. Staff are friendly and helpful. Always a pleasure to eat there. My husband and I went to your Kamloops Red Robin Restaurant on Saturday, May 14, 2016. The food was very good, and the service even better...our server was Bailey and she was awesome! However, the air conditioning was on much too cool.....people were walking in with shorts and T's because of the very warm weather, and once you got seated, it was absolutely frigid!! We almost got up and left. Really, does the AC have to be on at the max and not moderate? It's the norm that when a person says they are cold, most establishments do their very best to turn down the AC a bit for them....but here it was not pleasant at all....sorry, but we won't be back, and our many friends won't be either! Very good service and great meal yesterday! LOVE their burgers! Too many survey sites....rarely can access he one to do your survey. End up on a general My Survey site".........frustrating!! Outstanding service, good food, pleasant atmosphere. fun being there. Vonigue was outstanding in taking care of our needs. Just finished having dinner at our local Red Robin. We were seated promptly, although the restaurant was very busy. My husband ordered a beer, and it took 15 minutes for that to come. We were seated right by the bar, and during that fifteen minutes all we saw was the bartender standing at her till/computer entering information, she did not mix or serve one drink during that time, even though there were two waitresses who kept coming to the counter looking for their drinks. Our meal order was taken in a timely fashion, and I was somewhat surprised when my meal came that the portion was considerably smaller than the last time I had eaten at Red Robin. I ordered the Prime Rib Dip which is my favorite. My meal tasted good, but as said the portion was noticeably smaller than any other time we had eaten at the restaurant. The service at your Pittsburgh Mills Red Robin was horrible. My grandchildren did not receive there root beer floats until they almost done with there meal. Meal was also served cold. The waitress was horrible. My son in law and I called manager over and he gave us the kids meal free. That was very nice, but my meal was cold. The people are super nice and the service is excellent. not to mention the delicious menu with a whole selection of succulent meals to chose from, not only for adults but kid as well. thank you Red Robin! Had dinner with a friend today at your Foothill location in SLC, UT. Food was great - service was very poor and slow, and it wasn't even the dinner hour yet. Server gave the impression we were a bother. Probably won't go back - at least not to this location. Seems the prices are up. I have always had problems with the Curbside dining but the way things are handled in the store it makes up for it and keeps you coming back. They are fixated on customer service and it shows. Went in there for the first time in recent history, due to piss poor service in the past. Food used to be good, but service sucked. ANYWAY, first thing I noticed is that you have restyled yourselves as "gourmet". This has rarely been a good thing in the past, and I entered with skepticism. Ordered a couple of (NON alcoholic) drinks to get started, and after THAT $10 hit to the pocketbook, discovered that all your burger prices had nearly tripled and the one I usually ordered was nowhere to be seen. If I wasn't already $10 into TWO drinks, I would have walked out. Decided to have the "Pig Out" Tavern double(Bacon double cheese burger anywhere else), and figured for $9 that must be one hell of a burger. Kid had the Fiery Ghost tavern double. What I got would have been acceptable at Burger King. And in fact strongly resembled their basic Bacon Double Cheese Burgers that I have been eating in there for 35+ years. The only difference was THE PRICE. Kids burger was the same sorry thing minus the bacon. I paid $30 for a meal that I literally could have gotten a mile down the street for about $12. Minus the alleged "ghost pepper" sauce. I will NOT be returning to your restaurant under any circumstances, and am going to be spreading your new GARBAGE food at "gourmet" prices to everyone I can think of to talk to. Seriously, Carl's Junior has burgers for half that price that are half again as big and actually taste good. If you are going to charge THAT MUCH for a freaking double cheese burger, at least use 1/4lb patties and not 10:1 freaking baby burger patties you can get for 69cents at mcdonalds. My brother and I stopped at Red Robin following a baseball game at about 8pm the place was not crowded at all. All we ordered was a hamburger and a dip it took more than an hr. to get our food. our server apologized in a joking manner saying he yelled at the kitchen about our order. No manager came over and apologized for the delay or offered an explanation on the delay. Although $5.00 was subtracted from our bill I feel this was handled in an unprofessional manner. Get family place for dinner. we have been coming to Red Robin in Lancaster since it opened, however, the other day we visited the restaurant and our server was Nora; the best server we've had there, great personality, very nice and on the ball. we complimented her, asked if she was new....we learned she is a DAY employee and leaves by 4 or 5......we realized we had always visited after 5 or 6 prior......now, we might make it a habit to visit earlier AND ask for Nora.....very pleasant ! My lunch on 4/23 came to $15.00. By my records, I left a $3 tip. Yet, when I reconcile my credit card statement, I've been charged for $20.00 instead of $18.00. Do you have a way to verify this? Table 46/3, 2/20016. Server Nina. Another number on the slip is 2097164. Any help on this? I also for got to say that I celebrated my birthday there with a group of 7 and the wait time was very low. Our server Jenn P. was excellent and very nice. The birthday signing by the employees was a added bonus!! being seated. Great service as well. I ordered a burger -very good, fries were dead (as if they had sat under the heat lamp too long) The second order were fresh and good. My wife had the cheese steak - cut in half - one half was hot, other half was cold. her sweet potatoe fries were also dead - however second order were fine. Waitress said she would talk to the manager about the cold sandwich - manager never came to table. Utah...need I say more! Love the state but why ask anyone over 70 years of age for their ID, before they can receive a beer! My husband was told it was a state law. A manager told these 71, 84 and 90 year old Veterans that the waiters were told to check on expired licences?? These men were insulted. They were told it was a company policy, but I doubt if they wouldn't ask people in other states for ID. Both 6 and 8 weeks previously this group had ordered beers from the Layton, Utah location without anyone asking for ID. I love the fish and chips but my husband refuses to go back. I agree. We had a large party ...around 20. Two servers...the server at my end was Jodie. Jodie was very good...attentive, polite, and helpful. Red Robbin does not take reservations but I am happy to say the get together went on without a glitch. Portland was central for all family members to meet from miles away. Red Robbin was awesome...Thank you! Stopped at Red Robin in Exeter on 4/11/15. Mel was our server. Great service and good food. Mel was very attentive to her table's needs. Great server. First RR visit and will definitely go again.